It happened on a day of doubts and indecision. I found myself wandering along an unfamiliar dirt track through farmland in north east Scotland, toying with plans for the summer and searching for solutions to some big questions. 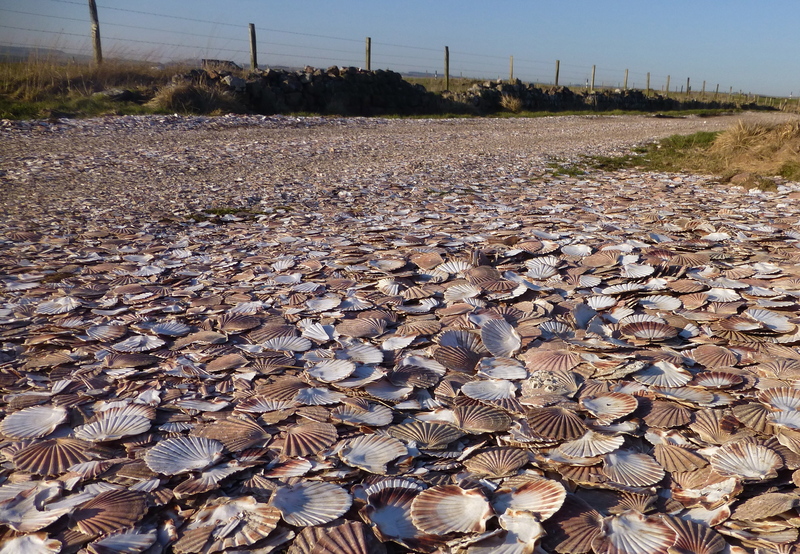 And after I’d walked through the predictable mud and gravel, I stopped, stunned, as the dreary path gradually gave way to the glorious ridges, pinks and peaches of the symbol I’d followed for a month across Spain; I’d stumbled across a Scallop Shell Road. Some shells were crushed and broken by vehicles and feet, others were still entire and enticing me forward in the way I followed them for 500 miles on walls, on pavements, through woods and streets and swinging from the packs of fellow pilgrims all the way to Santiago. Filling potholes may be practical but it seems such a mundane finale for the fine shapes and colours of the Coquilles St Jacques and I wonder if they’re used like this elsewhere. So was it coincidence – or an omen? Chance, or a clear sign that I should set off again to follow the mark of the scallop shell? I was stopped in my tracks! What an interesting road! 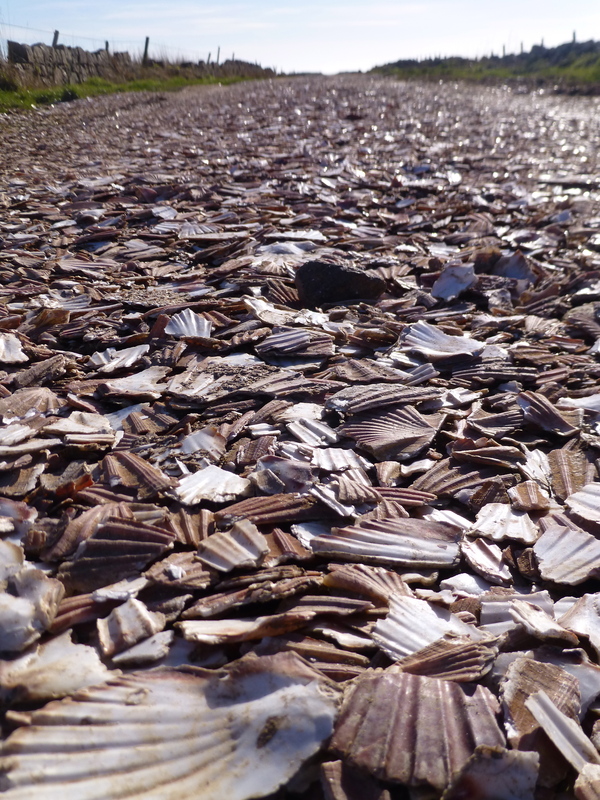 It’s amazing that shells can be used to make a road. They’re so pretty and delicate it seems wrong to drive or walk over them and hear them break . How cool! I’ve never seen anything like that! BTW, thanks for traveling over to my blog and saying hi. I would like to spend a bunch more time checking out your lovely site. Let them lead you on a journey! I’ll try Sheila… if I can ignore the conflicting signs. And you can’t choose the signs that come your way! Thanks for visiting and good luck with your plans; I’ll be following your story. Buen Camino. Amazing find Nancy. This week I paid attention at one point to the sound of my footsteps crunching on a gravel path at the golf course. Maybe all roads lead to Santiago. Definitely an omen. I spent a happy couple of hours wandering the beach at Finisterre and found only a few insignificant (in size only) scallop shells. I couldn’t believe my eyes on seeing your photos. I am only six weeks away from starting the camino Portuguese at Lisbon, and I didn’t have any signs to encourage me, just a desire to get back on the road. Lovely post – thanks. I couldn’t believe my eyes either. Buen camino for your journey, and look forward to following your story. I would definitely take it as a message from the universe to follow the scallop trail. Have a wonderful journey! Thank you; I’ll keep you informed!